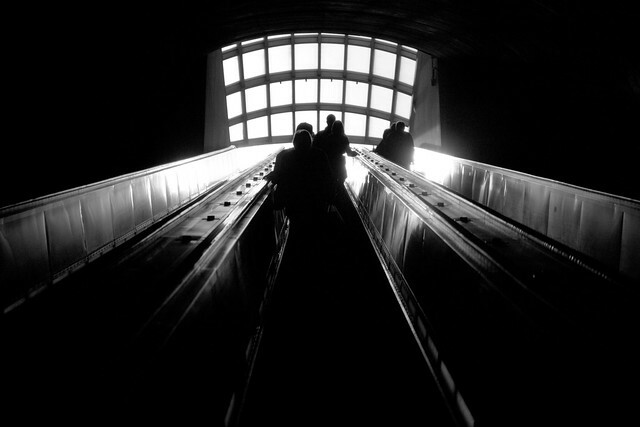 D.C. residents cheered when three new escalators opened at the south entrance of the Dupont Circle Metro Station in October 2012. The Washington Metropolitan Transit Authority (WMATA) closed the southern entrance for repairs for nearly nine months, but the wait was worth it, in theory. WMATA had decided to strip the entrance and rebuild from scratch this past summer, finally doing away with some of the least reliable escalators in the system. New “transit-grade” escalators promised a better commute—to “unsuck” D.C. Metro—in one of the city’s busiest, and deepest, subway stations. In reality, Metro and its faithfully frustrated riders were forced to deal with 20 outages in the first 40 days after the grand reopening. Construction is a constant in the nation’s capital, but, for one reason or another, it never seems to go according to plan. Just ask any Wizards fan who is still waiting for their team to climb out of the gutter. Supporters of D.C.’s pro basketball team have suffered through nearly 200 losses and some of the worst basketball the Association has ever seen for almost five seasons now. We all know about owner Ted Leonsis’ blueprint for rebuilding his Washington Wizards: stay financially flexible, sign free agents and develop supposedly talented prospect. And, perhaps, trade some of said prospects for major players when the opportunities arise. And Jordan Crawford, in his third season, has taken steps in the right direction. The combo guard is putting up career-highs in points (15.6), assists (4.6) and rebounds per game (4.0). J-Craw is also sitting on the best PER of his short career, 16.58, to go with his best Offensive and Defensive Ratings (100 and 107, respectively), but he’s a productive 6th man at best, and possibly trade bait to snag a predator a little higher up the food chain. As for No. 6 overall pick Jan Vesely, we haven’t seen much of him on the court, and you’d be out of luck if you were hoping to find his jersey on the Wizards’ online team store. But Vesely has played OK in limited minutes, highlighted by a 10-point, seven-rebound game against this week against the Thunder. Fan-favorite Trevor Booker had this to say about potentially making his 2012-13 season comeback versus Atlanta this Saturday, per Craig Stouffer: “I’m ready. I’m back to my usual self, dunking on people, scoring 30. That’s what I do.” I looked up his stats. Booker has never dropped 30 (and his career average is 6.7 points per game). Chris Singleton? Some say he changed his name to DNP – Coach’s Decision. The Washington Wizards are terrible at being terrible. I’m pretty sure. In sports you sometimes have to be bad to get better, but the Wizards have been bad and have only gotten worse—26 wins in 2009-10, 23 wins in 2010-11, 20 wins in 2011-12, and just five wins this season. In recent memory alone, the Wiz have signed, released, then resigned Alonzo Gee, James Singleton, Cartier Martin, Shaun Livingston, and Shelvin Mack. And the roster has generally been so bad that all five of these journeymen started for the woeful Washington at different intervals. In some cases, kicking the tires has paid off: James Singleton was, arguably, the most productive Wizard last season. But with others, regret has been a common theme. Shaun Livingston, signed before the 2012-13 campaign, played just 18 games before being waived for D-Leaguer Garrett Temple. Alonzo Gee, 25, had a breakout season for the Cavs in 2012, averaging 10.6 points and 5.1 rebounds per game. He was named the team’s most improved player and the front office handed him a three-year $9.75 million contract in the offseason. For the Wizards, it’s not so much a case of not knowing what you had till it’s gone. It’s more of an ‘If you don’t really know what you’re looking for, how will you know when you’ve found it’ sort of thing. There’s a lesson to be learned in sports history. On the gridiron. Let me take you back to the mid-1900s. In the 1950s, the Green Bay Packers were, in a way, a lot like today’s Wizards. They won championships between 1929 and the mid-’40s, but the Green Bay teams assembled in the post-war era played as big as the town itself (then, claiming about 62,000 people). Everyone was searching for answers, but mostly the nearly 1,700 shareholders, including the majority shareholders at the American Legion Sullivan-Wallen Post No. 11, who in 1949 bought nondividend stock at $25 a pop to save the Packers, a publicly-owned nonprofit, from financial ruin. Neither the locals nor the legionnaires had any real power, but that didn’t stop them from meeting to plan a front-office overhaul. It started at the top. The Packers hired, then fired three coaches in nine years—Lisle Blackbourn, Gene Ronzani, and Raymond “Scooter” McLean. That trio lost 72 games, but Scooter McLean was arguably the worst offender. He really did give a damn, he wanted to win, but didn’t know how to unify his locker room. Think Flip Saunders’ Subway-fueled nightmare as Wizards head coach. McLean’s team during his one-year stint as head ball coach was historically bad, on par with this year’s 5-28 Wizards (whose locker room is holding up, somehow). Knuckleheads, anyone? It sounds familiar. It was ugly off the field, too. The president of the Packers board of directors at the time, newcomer Dominic Olejniczak, had to face an effigy of himself swinging from a lamppost outside his office before his coach was pressured to resign. Things had to change, and they did. Long story short: Second-year boss Olejniczak hired Vince Lombardi, the New York Giants offensive coordinator, and that put them on the right track. The Pack would be back. Lombardi had mastered the skill of empathy, helping him motivate players and work a room, and he always seemed to get his way. The running joke was that he treated everybody the same, like dogs. But there is absolutely no doubt Lombardi got the best out of every player by his side. Lombardi, addressing his full team of Packahs for the first time in February of 1959, boomed: “There are trains, planes and buses leaving here every day, and if you don’t produce for me you’re gonna find yourself on one of them.” Sensenbrenner Hall at St. Norbert College, where the Packers were holding camp, was dead silent, almost muted by shock. Lombardi was no Scooter McLean, that was clear enough. But it was the first time in a long time that someone had begun to ask the right questions. Can you play? Will you sacrifice for your teammates? Will you play through the pain, whether physical or emotional? The media, at a glance, didn’t think too much of the toothy Italian’s chances in America’s Dairyland, despite already having young players like Bart Starr, Jim Taylor, Forrest Gregg, Willie Davis, Jerry Kramer, Ray Nitschke, and Hornung at his disposal. “Last and probably least—that’s the sad forecast for the once-proud Packers. They’ve got a good new coach in Vince Lombardi, but he might as well kiss this one off as a rebuilding year,” predicted “Sport” magazine. Lombardi had already waited a lifetime to be named an NFL head coach. He’d never been associated with a loser, and didn’t plan to start. In his first year as head coach, he produced Green Bay’s first winning season in more than a decade—seven wins, five losses. Lombardi was named Coach of the Year and would go on to win five championships, including the first two Super Bowls, and would develop 12 All-Pros. Lombardi’s plan to win was centered around three principles: repetition (only perfect practice makes perfect), confidence, and passion. Those principles had shaped Lombardi’s coaching philosophy from the beginning—even as a basketball coach, leading St. Cecilia High School in Englewood, N.J. to a regional championship and later coaching Fordham University’s freshman and varsity teams between 1947 and ’48. This brings us back to the Washington Wizards. Ernie Grunfeld, who joined the Wiz as President of Basketball Operations in 2003, has said the team has been “very pleased” with the development of its young players and their “commitment to winning” under Coach Wittman, who everybody within the organization seems to support. But is Wittman (or Grunfeld, for that matter) the long-term answer? If not, the players will likely have to learn a new system, find new roles, and perhaps be asked to develop new skills—more disruption that’ll only set back a team that has had four head coaches in four years. Where’s the change we’ve all been promised? Color schemes, logos and the jettisoning of a few knuckleheads notwithstanding. It doesn’t seem like it’s around the corner, despite taking down a premier Western Conference foe in the Thunder on Monday night (they’ve done that before, along with defeating the Los Angeles Lakers and the Miami Heat). See, the brass thinks it’s too soon to evaluate the team’s performance: “Once we get everybody together, that’s when we’re going to have to evaluate,” Grunfeld said before Christmas. When will the team have everybody together, exactly? Saturday, when Booker and Wall finally return to action? Or later, when Wall plays himself into game shape? Or was Grunfeld referring to the start of next season, when the brutal 2012-13 campaign is all but forgotten, indistinguishable from seasons past, and the hope for relevancy is pinned to the nameplate of another top lottery selection? Or worse, giving away a top lottery ticket for have-been, no-good veterans. Memphis has started to ask the right questions. They’re not satisfied, despite being 23-10 with the 4th seed in the West, and they’re not waiting till the moment is right to take action. The Grizzlies’ new-look front office doesn’t think its roster is “constructed to contend for the Western Conference title” and is looking to shake things up by possibly trading Olympian wing Rudy Gay, reports Yahoo!’s Adrian Wojnarowski. Winning isn’t a sometime thing, it’s an all the time thing … unless you’re in D.C., where you’d be hard-pressed to see consecutive wins outside of Tanking Season. Problem is, Tanking Season (April)—where the Wiz are 13-10 over the past two seasons—is always a time for optimism from the front office. It was playoffs or bust this year, and the Wizards must be looking for a refund. The 5-28 Wiz are projected to finish 18-64, the franchise’s worst record since 1998-99. At best, they could finish 33-49—in other words, a banner year that will have produced more wins than half the Wizards teams over the last 15 years. They’ll surely win a few more games this spring, but is a 30-win season and a last-place finish in the NBA something to write home about? Will a second-half turnaround excuse the beginning of this season? Injuries are a convenient excuse for hard times, but let’s be serious: The Wizards aren’t the only team that has had to deal with bumps, breaks and bruises. The 2010-11 Packers, for example, were forced to put 16 players (seven starters) on injured reserve, but they still managed to win a Super Bowl. Where do the Wizards go from here? Like Metro, the Wizards don’t seem to be adhering to their own maintenance standards, and appear destined for another fresh start in 2015, when Nene will be the only Wizards player with a guaranteed contract. The escalator to the top appears to be out of operation, indefinitely—the Wiz have installed a lot of replacement parts, but they’re still dealing with yesterday’s transit authority and expecting better service. But the steps out of the depths are there. Unfortunately, climbing out sounds like something for another day—a resolution for another year.